The activity is held approximately monthly at the Johns Hopkins Bayview Medical Center in Baltimore, Maryland, in a multimedia classroom constructed specifically for the learner's needs. This is a workstation-based training program, designed to meet American College of Cardiology/American Heart Association Level 2 requirements. Each participant has their own workstation to use throughout the activity and receives personal attention and instruction by the activity faculty. 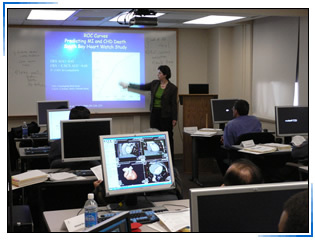 An additional workstation, which projects to the front of the room, is used by instructors to demonstrate various aspects of CT interpretation. After receiving training on the use of the workstation, a case library of over 300 cases selected to demonstrate the variety of pathology, which can be evaluated by CT (coronary disease, bypass grafts, stents, anomalies, cardiomyopathies, EP, pericardial disease, cardiac tumors, etc) are reviewed. Several hours are devoted to reviewing issues in valvular disease, including making measurements for TAVR. A minimum of 100 cases will be reviewed during the 5 days of the activity. 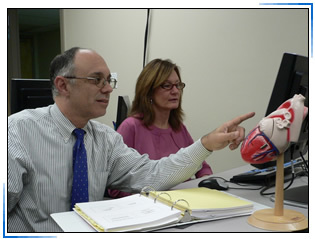 Twenty hours of didactic instruction is included through lectures and reading materials, which cover topics of patient selection, preparation, radiation, contrast, cardiac anatomy, assessment of cardiac function, cardiac pathology, etc. Members of the Johns Hopkins faculty and guest faculty present these topics. Participants take a written quiz to confirm understanding of these materials. The requirement for observation of the acquisition of 50 studies is satisfied by utilizing a combination of onsite observation of approximately 25 studies supplemented by interactive observation of approximately 25 studies performed offsite and viewed by interactive videolink. Participants have the opportunity to ask questions during acquisition of the studies (i.e., patient selection, use of beta blockers, etc) and to observe the steps in obtaining the scan by direct observation of the scanner console. The 50 scans that were acquired during the week of the activity are anonymized and participants interpret these studies on their own time following the 5 days of onsite training. After faculty review of the participants' interpretation of these 50 studies and the other elements of the activity, a certificate documenting completion of the level 2 requirements is issued. The course provides everything that is needed for Board eligibility, and everything required for CT reading privileges at most hospitals. Note that the COCATS document published in 2015 recommends more training for fellows to attain Level II, including one month of devoted clinical time, 65 live cases and 250 total cases; these criteria cannot be fully accomplished in a 1 week course. There is a learning curve that must be overcome to master cardiac CT, and the amount of material to be covered is large. Therefore, these days will be long (8:30 a.m. - 7:30 p.m. on Monday, Tuesday and Thursday and 8:30 a.m. - 5:00 p.m. on Wednesday and Friday), and it is expected that participants will be present for the entire week. Breakfast and lunch will be provided on site. An evening event, which will include dinner, will be arranged on Wednesday during the course. These meals and events are included with the registration fee. A small office will be available for making and receiving phone calls, sending and receiving e-mail and faxes, etc.